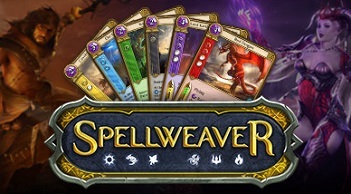 Spellweaver is a free to play collectible card game (CCG) developed by Dream Reactor LLC that is currently available for Windows PCs on Steam. Versions for Mac OS, iOS and Android are planned for the near future. Spellweaver is a digital only CCG that attempts to combine the best features of many of its forerunners into a slick package with the accessibility of Hearthstone and the tactical depth of Magic the Gathering, and is largely successful in doing so. The play field and base play mechanics are similar to MTG. Some notable differences include the ability to attack creatures directly (effected by the creature's speed stat) and a unique take on mana/resource cards which can be played in a variety of ways to help mitigate the mana flood/screw that can occur in MTG. Resource cards called shrines can be played as a hero boost, a mana card, or used to draw a card. The play field features a back row similar to Yugioh, and (most) creatures played there cannot attack or be attacked, but rather serve a support function for the front line cards (similar to Cardfight!! Vanguard). 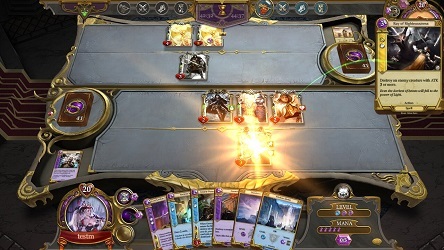 Deck building can be done with any combination of cards from six differently colored factions, each with unique back stories and play mechanics. In a sea of free to play CCG's, Spellweaver is one of the new breed games that stands out by combining the best of the old with the best of the new. The game features a great tutorial that is helpful in getting new players started. The card art is good and card stats and abilities are easy to understand. A lot of work has gone into and continues on in balancing the cards and factions. The game features tournament and spectator modes, ranked and unranked play, trials/drafting (similar to hs arena) and single player versus ai play is in development. The free to play model is generous by all reports, rewarding in game currency (win or lose) for multi and single player play, daily quests and other challenges, and all faction starter decks are earned in game for free.